I’ve actually been wanting to alter t-shirts for awhile now, and have had some stowed away in a corner for just such an occasion. 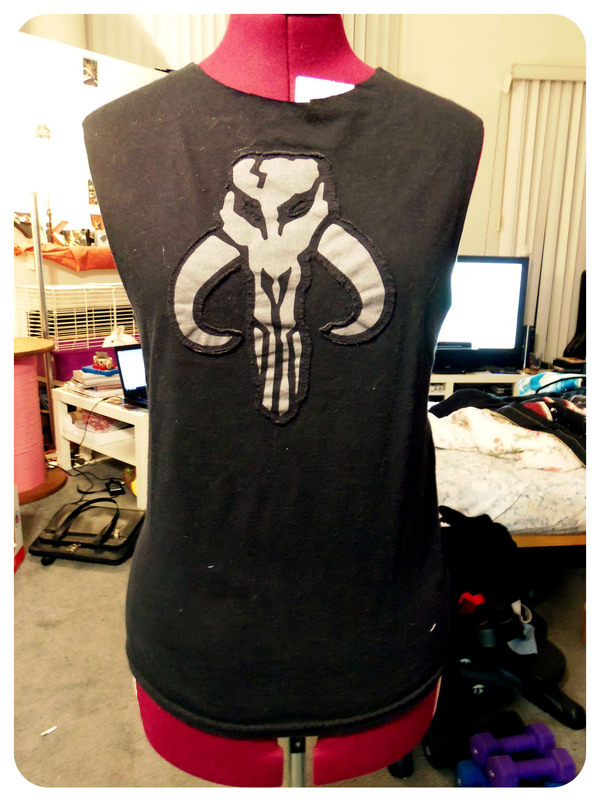 I had swiped this Boba Fett/Mythosaur skull shirt from the bf sometime back because he never wore it and I knew I would, or could use it for a craft at some point. After reviewing some article and videos via Google and YouTube (like this article, or these videos here and here) I decided to just dive in and wing it. I stress the “wing it” part. 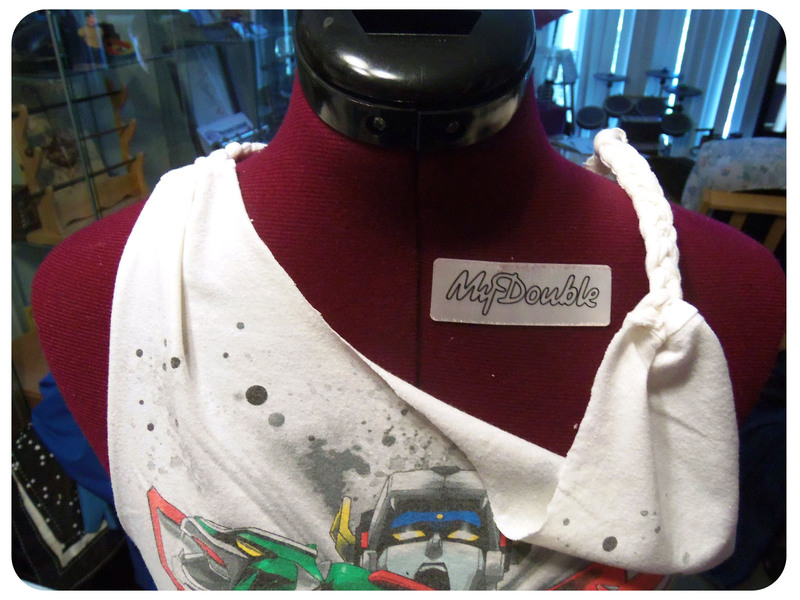 Cut off the sleeves and collar of the t-shirt. 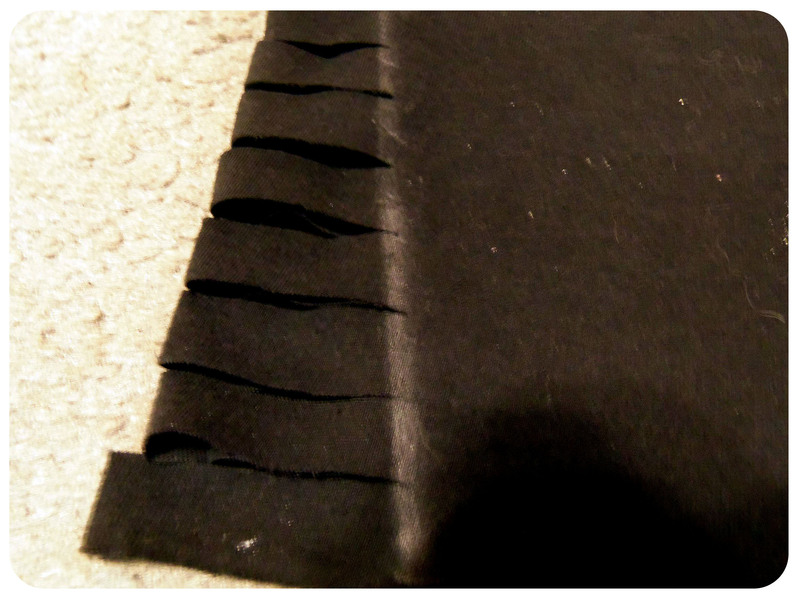 On the sleeves I cut about an inch away from the seam to create more of a tank style shirt. 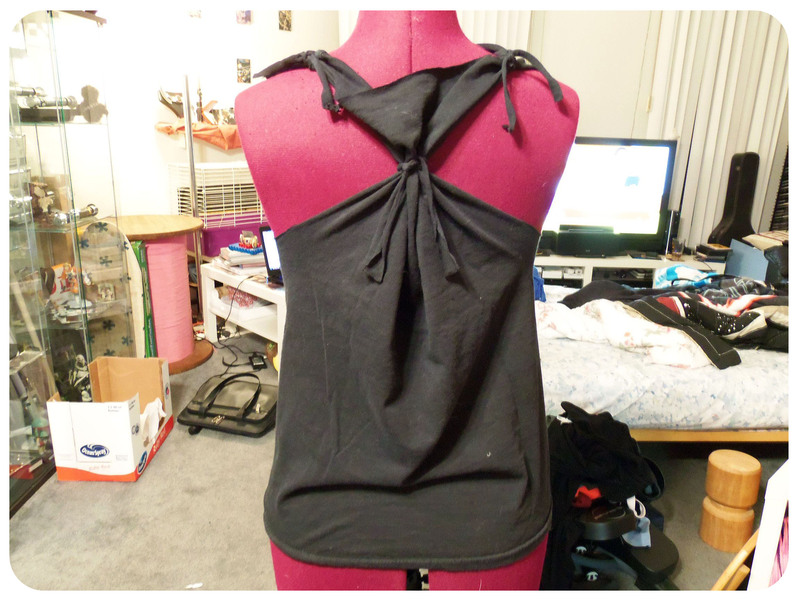 I cut strips of fabric from the the sleeves I’d cut off in order to tie back the sleeve holes and create a racer back style tank top. 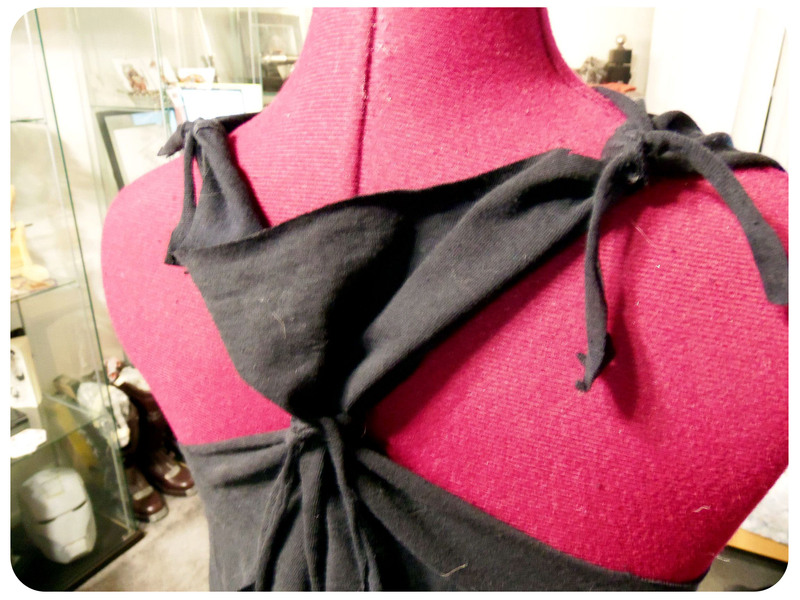 I also used stripes to tie up the neck line at the shoudler seams, as well as tie back the excess fabric you see there in the first two images. Make sure to keep all your scraps that you cut off as you’ll generally need/want them to use! I was really unsure of what look I wanted, there are SO many options. I decided to go ahead and go with some slits on the side. 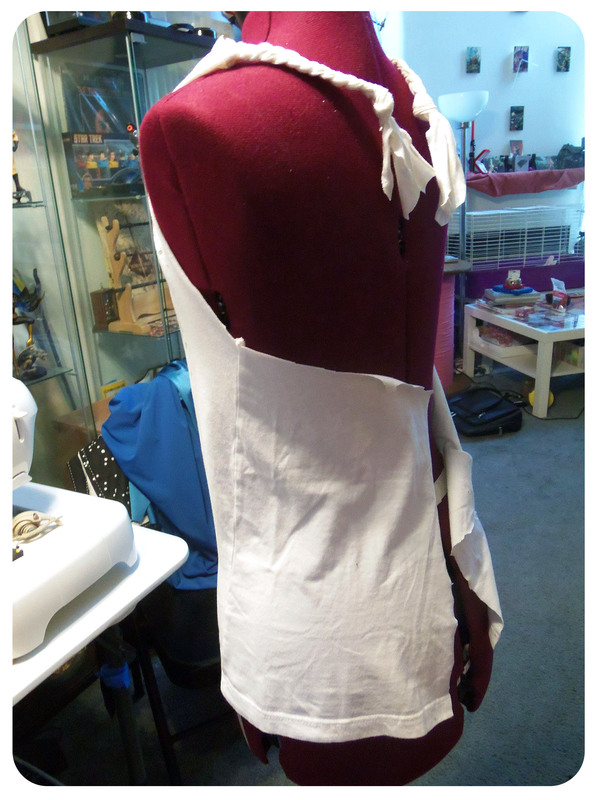 I measured an inch below the arm holes and then used a ruler to mark a diagonal line to the bottom hem. I didn’t bothering measuring the slits I was a cutting, I just cut the size I wanted and went from there! If you’d like to be more precise in your cuts, then feel free to measure everything you do before cutting, but since the style of these shirts is to be a bit “rough”, I didn’t mind being somewhat imprecise. 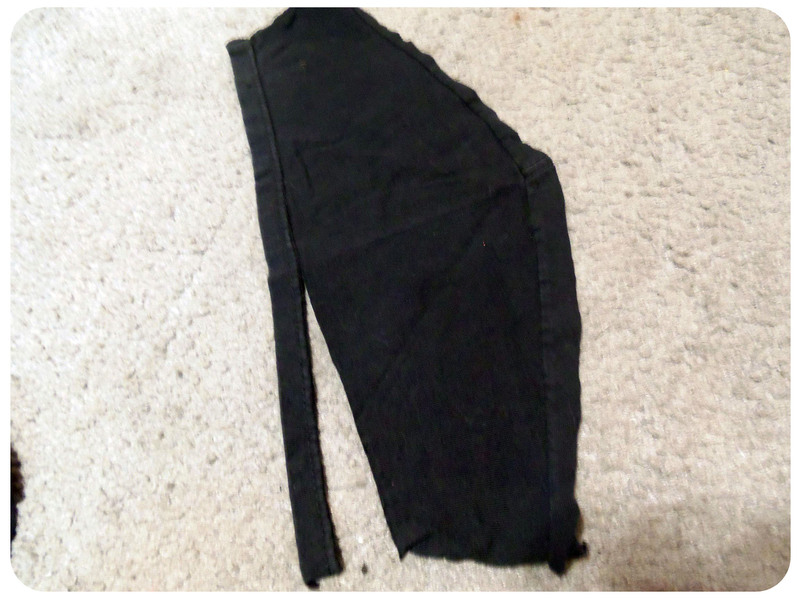 Here’s an example of the strips I cut from the sleeves. Again I just eyed the width of the cut I wanted and went from there. I used these strips to tie up everything on the shirt. Here’s a side view of how the slits turned out from Step 3. Because I didn’t really know what I was going to do until I was doing it, there was one step I wasn’t able to photograph. 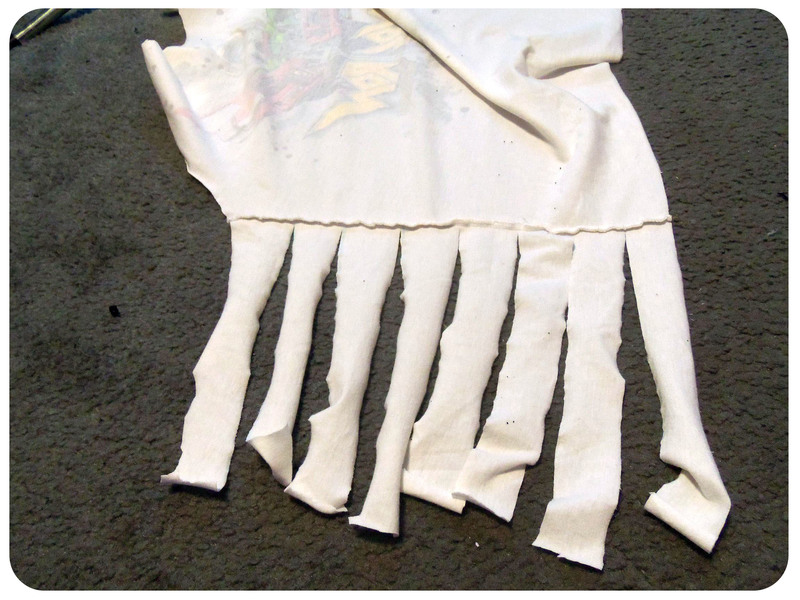 As you can see in the last image, I decided to cut a large hole in the back of the shirt…roughly 2 or 3 inches away from the slits and the arm holes, everything else was cut away. 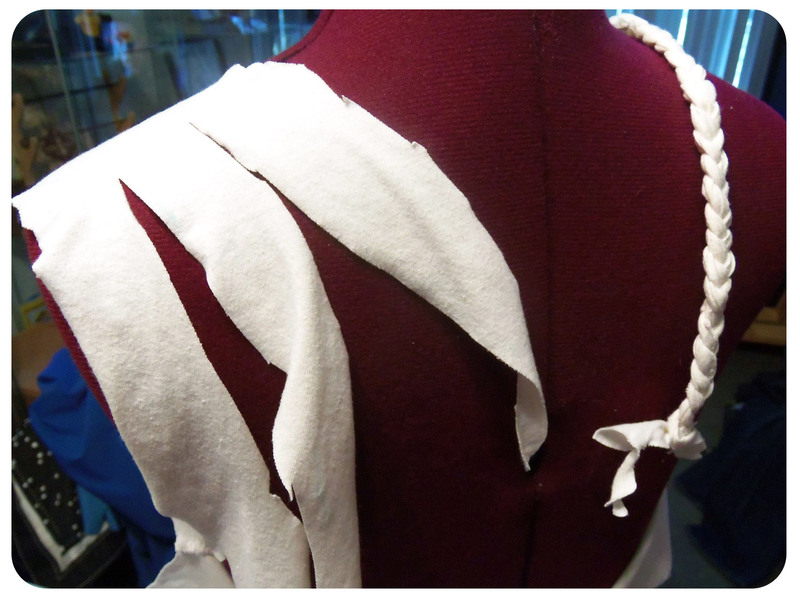 I then used the strips seen in Step 4 to tie the back of the shirt back together by connecting the side slits in three places. And after only about an hour of cutting and fumbling around with a t-shirt, I suddenly had the end result you see! It’s pretty basic, but it’s way more fun of a shirt to wear now than it was when I started. After tackling that shirt, I decided to tackle one more, this time Voltron! I love this shirt and had been dying to tear it up into something more interesting then just a plain t-shirt, but had it buried in a box for years unable to be inspired. I’d already hacked off the sleeves and collar from an earlier attempt to try to do something with this shirt. 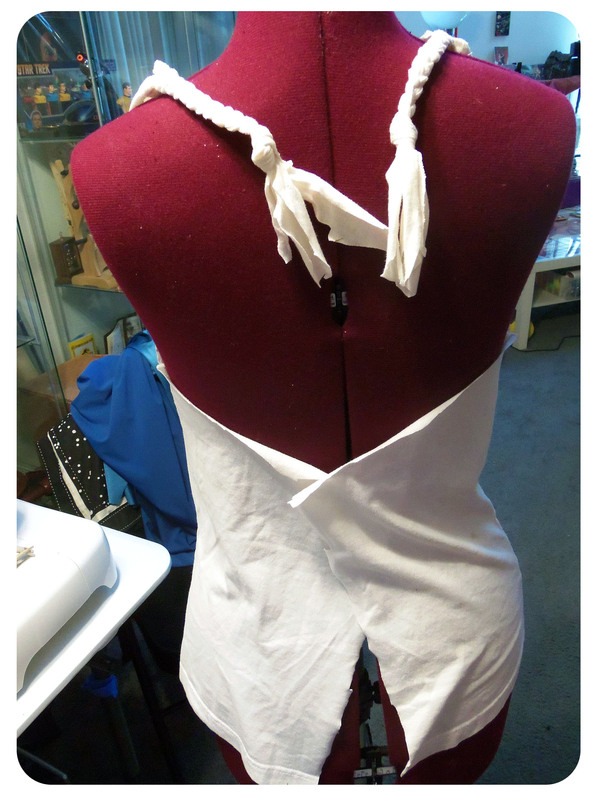 I decided I wanted to try some braiding with this shirt, so starting at about the middle/waist level of the back of the shirt, I cut three strips into the shirt and ended at the shoulder seam. I then braided the strips and knotted the ends. 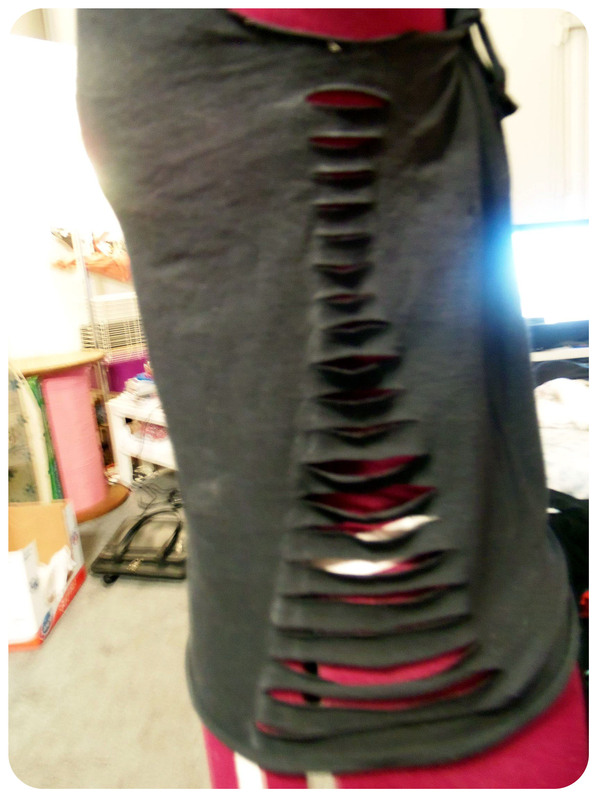 Then I cut open the remaining part of the back of the shirt. There was also a bit of excess fabric I hadn’t needed after cutting and braiding the top part, so that was cut away as well. 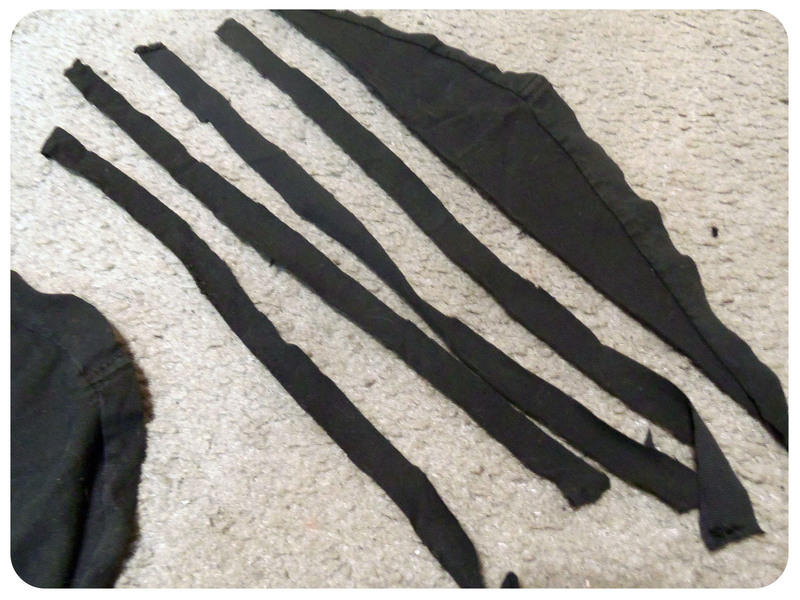 I then cut strips into the back pieces. 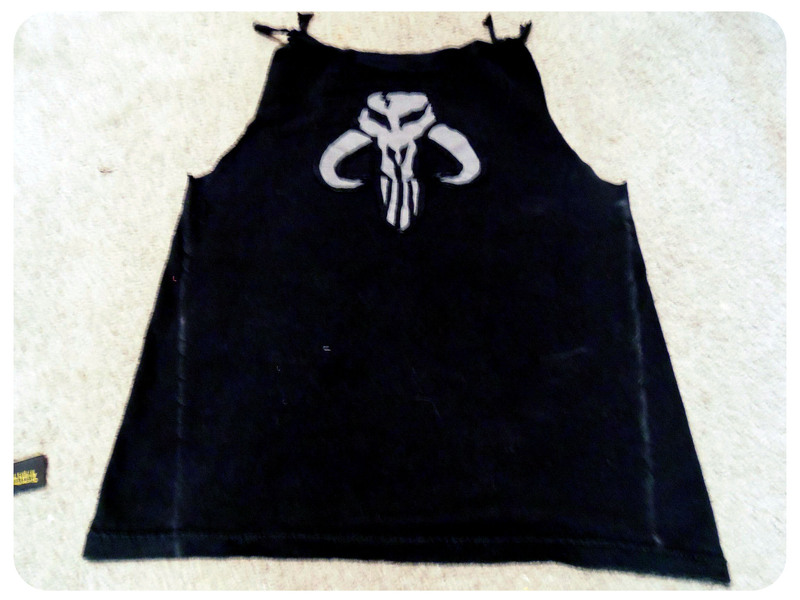 Again, as with my Boba Fett shirt, my measuring was pretty arbitrary and mainly by eye. I braided the top three strips and the bottom three strips, and knotted the ends. You can see the result in the second image. I had two excess strips in the middle of the two braids, and these excess strips were cut off. Remember: Always keep your scraps! 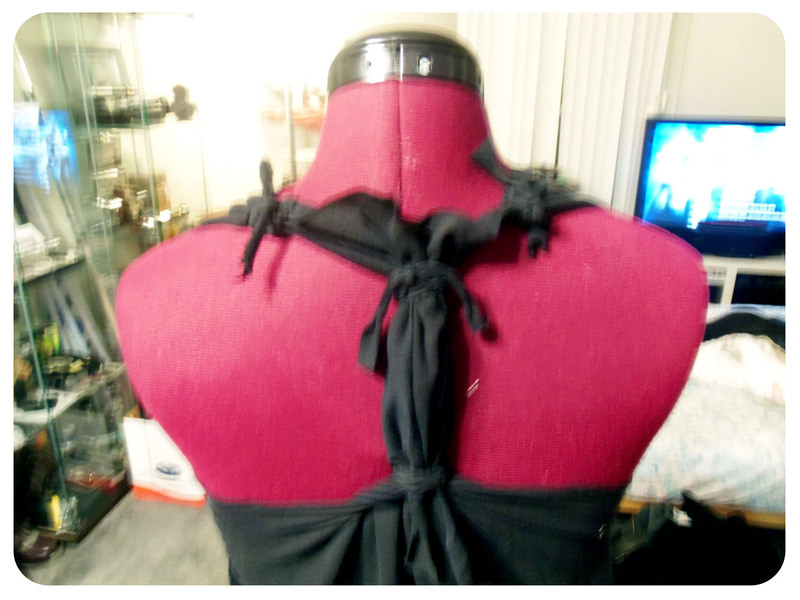 I was fumbling a bit with how I wanted the shirt to connect to itself, so I ended up tying the the two neck braids together. 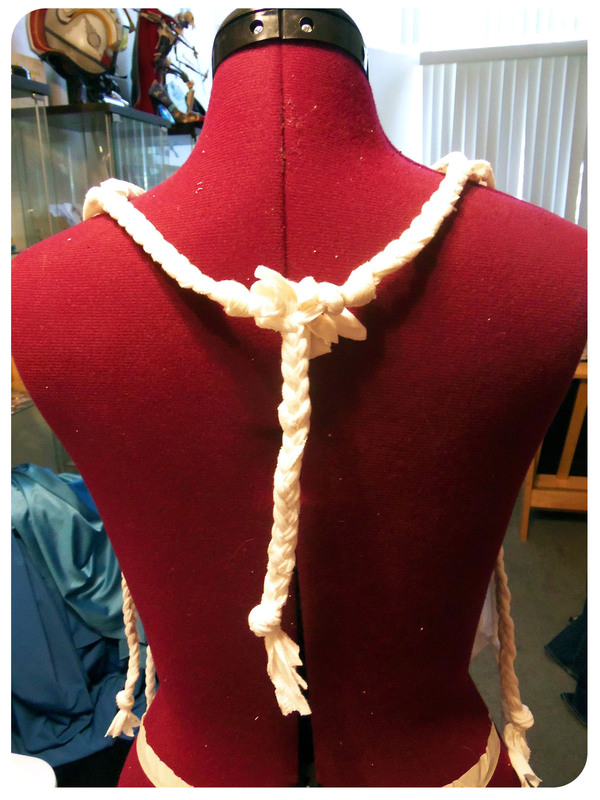 Then I tied three strips of scrap fabric to the knot and made a new braid out of that. I used the vertical braid you see here to connect the top two waist braids together. I wanted to have a bit of fun with this shirt and decided to add rhinestones to it! I had E-6000 lying around so I used that, though you may prefer to use a different adhesive. I worked with the design of the shirt, which has a bunch of dots throughout the image, and glued the rhinestones over some of the dots at random. And voila! Shirt #2. You can’t really see the rhinestones too well in the image I took, but I can’t wait to wear this shirt out on a sunny day! The only braids I have to untie to get in and out of the shirt are the bottom two braids. Again, neither shirt is fancy, but they were fun, easy and super quick to do! It took about an hour or so to complete each one. 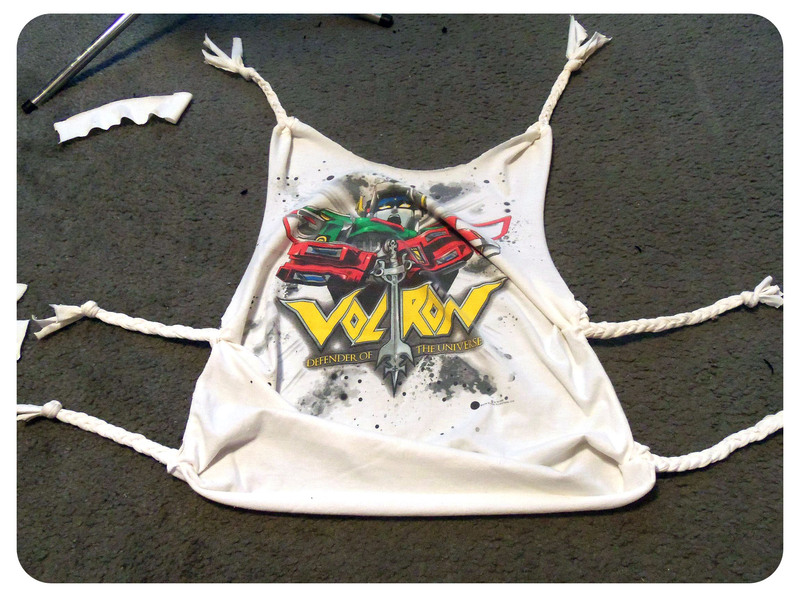 If you know how to make decorative knots, or want to learn how, then there are much more complicated and pretty ripped shirt designs you can create. The ones I’ve seen on Etsy are quite intricate and lovely! I’d like to note that pretty much all the ripped style shirts you see out there started as overly sized men’s shirts. That way you have plenty of fabric to work with and do things to in order to ensure a sexier fit on the female form, and wear it like a tunic or dress. I didn’t use shirts like that, instead they were shirts that already fit me but were just basic shirt styles, so the look and fit I got is more of a short fitted tank top. Just something to keep in mind as you’re deciding what type of look you’d like to end up with! And…a final note – BRAS! I’m sure some of you are wondering so I’d thought I’d say something about it. Clearly with shirts like these there’s no way getting around your bra showing, unless you have a racer back style bra you can use or decide to buy. But even that style of bra is going to be seen a little. 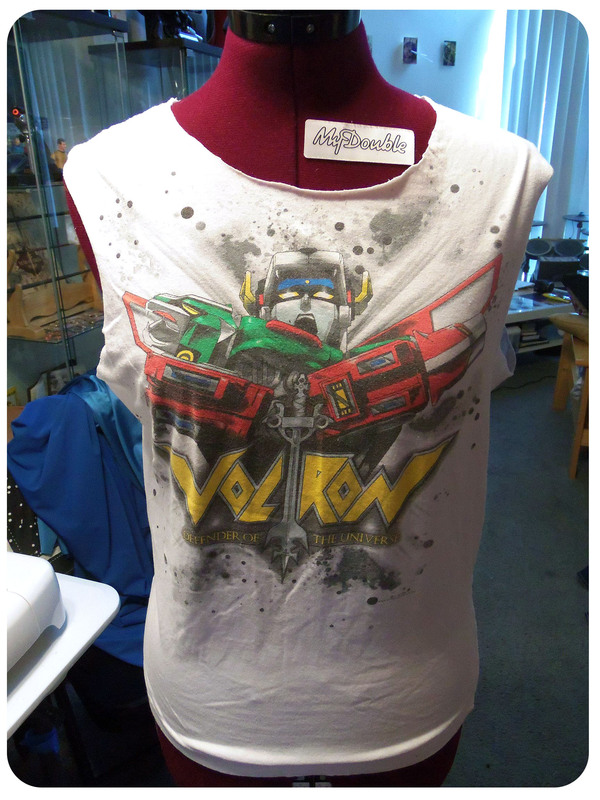 One of my solutions, for the Voltron shirt for example, is to buy a red, yellow or blue bra so that it coordinates with the Voltron colors and becomes a part of my shirt design. If you’ve got your own DIY shirt design you’d like to share, please contact us! 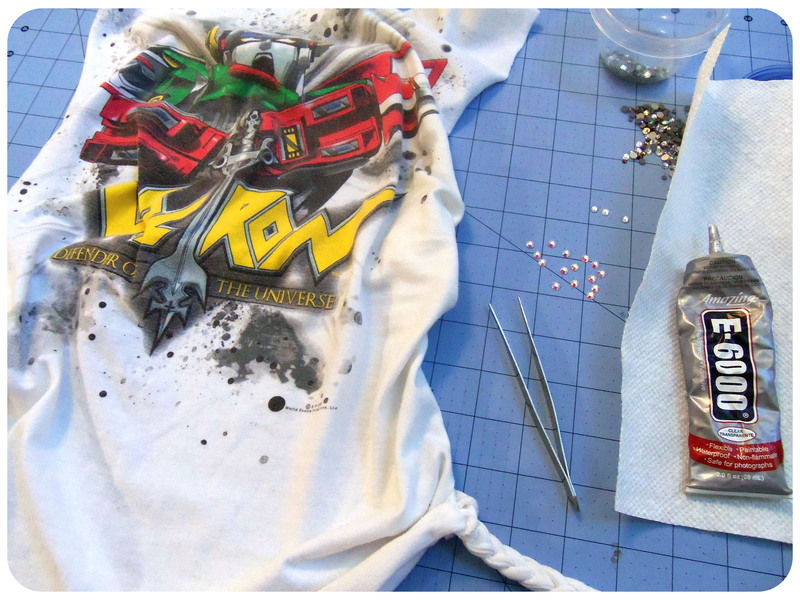 And if you try your hand at any DIY shirts after reading this tutorial, please feel free to share your results on our Facebook page, we’d love to see what you come up with! I LOVE this idea! I have SOOOOOO many guy shirts with awesome grafics, but they just don’t contour to the feminine form properly. Google, YouTube and Pinterest are our general go-to sources for DIY tutorials. 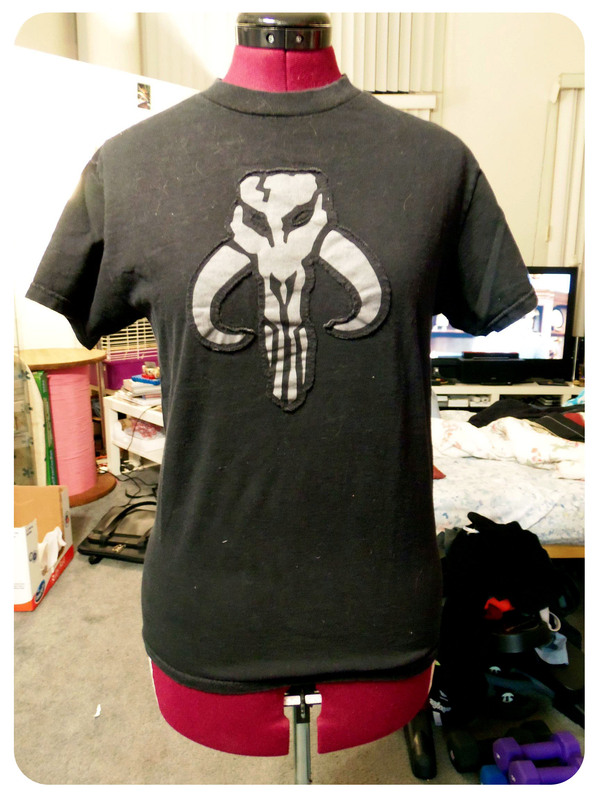 I love the mando shirt! It looks amazing! Do you know if the shirt is still out on the market? Thanks dude, I love it. Did the first one last night and it looks so hot. Thanks again!